You only need to read what she says in her inquest testimony.
" I heard the clock strike half past three"
Which tells us the clock struck on the half-hour, EVERY half-hour. "I was at her house at half past 2 on Friday morning". AT HER HOUSE, Harry, not on my way to her house. Lewis was already at No.2 when the clock struck 2:30 am. What we do not know is the time she arrived, or how long Lewis had been at No.2 before the clock struck 2:30. She did say she passed the Spitalfields church (clock), "about 2:30", so we can assume she can't have been at No.2 very long before she heard the clock strike on the half-hour, barely minutes? According to her inquest deposition, she says "l was at her house at half past 2 on Friday morning....I know the time by having looked at Spitalfields Church clock as I passed it". She may have heard the clock chime, as she did around the time of the scream, but it seems that her primary reference for the time was visual. And I can't think of a good reason for her to mention the time she was "at" the house unless it was the time she arrived there. Nothing noteworthy happened. Hutchinson also fixed the time visually in his press statement "I am able to fix the time, as it was between ten and five minutes to two o'clock as I came by Whitechapel Church." So either his sighting of Kelly and A-man lasted over half an hour, or the two church clocks were seriously out of step. Yes, this is what I referred to. What she did not do was give the time as she passed the clock. Elsewhere she does say she passed the clock "about" half-past two. What you appear to be looking for is her saying "it was half-past two as I passed the clock because I looked up to see the time". She does not say that. That is and has been everyone's assumption, but her own testimony say's she was at No.2 at half-past two. Which shows that long-held assumption is wrong. We can always second guess her reasoning, but not knowing what questions the coroner was asking her means we are trying to replace a fact with an assumption. By 'fact' I mean she actually did say she was AT No.2 AT 2:30. Whereas she only said she passed the clock ABOUT 2:30. Hutchinson also fixed the time visually in his press statement "I am able to fix the time, as it was between ten and five minutes to two o'clock as I came by Whitechapel Church." Notice Hutchinson does not say the actual time he met Kelly, he estimates "about 2:00 am", yet that was the significant event - right? 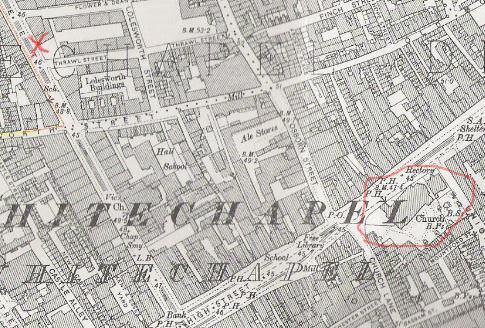 Hutch's timing is based on a past event (as with Lewis), that (several minutes previous) he had passed the Whitechapel church down on Whitechapel High Street. Do you believe Hutchinson met Kelly at, "ten and five minutes to two o'clock"? I would hazard a guess, not. We need to allow several minutes to pass due to the distance between the Whitechapel church & the corner of Thrawl St. The same consideration must be given to Lewis, though the distance was shorter. Several minutes between Christ Church and Thrawl Street, Jon? It would have been about a two-minute walk, if that. Are you suggesting that Shoreditch Town Hall don't know what they are talking about? Gareth, the Whitechapel church is down on Whitechapel High St, on the south side, between Union & Church. What we don't know is if he walked up Osborn and west on Wentworth to Commercial st.. Or, did he walk west on Whitechapel High St. then turn up Commercial st.? I'm asking for a contemporary reference. This is what I'm talking about Gareth. Wobbly red circle - Whitechapel Church. Red cross - where Hutch met Kelly. Last edited by Wickerman; 07-14-2018, 09:47 AM. Which church is that, Jon? I'd always assumed that Hutchinson meant Christ Church (Spitalfields), given that practically all the action in his story seemed to happen in its near vicinity. It's Whitechapel Church, Sam, St Mary Matfelon on Whitechapel Road. "I came down Whitechapel road into Commercial street.....I am able to fix the time, as it was between ten and five minutes to two o'clock as I came by Whitechapel Church." It's just about half a mile from there to where he met Kelly. "When it opened in 1866, Shoreditch Town Hall was known as one of the grandest Vestry Halls of its time and its ambitious founders wanted the building to embody their progressive values. Until the 1960s, the Town Hall operated as the centre of local democracy and civic life in the borough of Shoreditch. " Taken an interest in the building over the last nine years. That might not be contemporary enough for you,however it would suffice for most. The medical officer at the time was Dr Barnes,who resigned in 1868 and was replaced by Henry Sutton,MB Lond. Suspect the smaller adjoining Mayor's Parlor was utilized rather than the original Vestry/Council Hall. If Hutchinson was not heading for anywhere in particular, apparently the place where he usually slept was closed, then he may not have been hurrying along. Perhaps we can assume he was walking no faster than the measured stride of a beat constable? According to the 1889 Police Code, the pace of a beat constable should be 2.5 mph. Which is not particularly fast. Using your estimate of a half-mile distance (I didn't bother to check), then Hutchinson could have covered that distance in 12 minutes (5x12=60). Given he passed the Whitechapel church "between 10 and 5 minutes to 2:00", then after walking for 12 minutes he should have met Kelly between 2 and 7 minutes past 2:00 am. This helps in establishing when he could have begun following Kelly. Walking from that point to Millers Court may be slower, as the pace is now determined by Mary Kelly. Women tend to walk slower than men, so perhaps four-five(?) minutes till Astrachan & Kelly reach Millers Court passage? This does not include any time for Hutch to exchange a few words with Kelly on first meeting her. Plus her walking away, and then stopping to talk with Astrachan. On Kelly & her client reaching Millers Court passage, according to Hutch, they stood and talked, he estimated for "about 3 minutes". While he stood on the opposite side of the street outside Crossinghams. If anyone else walked westward down Dorset St. (from Commercial St.) and saw a man standing outside Crossinghams, and "further on" another man & woman "standing near the court", then we might be looking at a time between 2:20 -2:25 am. Not inconsistent with Lewis's testimony. Not proof by any means but if the numbers were way off then criticism would be justified. Truth is,most people walk at ~ 3 mph. Men tend to walk 10% faster than women. REplying to your latest posts to me Jon. What theory are you alluding to.I have no theory. Any difficulty I have is your latest claim of Lewis being in Keelers rooms at 2.30,and that all statements of her reaching and entering the court at that time are wrong.One little difficulty I do have though,is Lewis following and observing Kelly and Aman in the court as she(Lewis) entered.You have claimed that.At that time, if you read Hutchinson's statement carefully,He (Hutchinson) would have still been at, or just leaving the corner of Commercial/Dorset street,so could not have been the person Lewis observed standing outside Crossinghams.So who was the person at Crossinghams? I didn't ask for the names of the two professional persons you mentioned.I asked for the names of the unprofessional people you alluded to.Don't be shy,name them.If I am one of them i'll try not to cry. Yes I know the name Brideswell.Perhaps you will post a reference to show that what he says directly refers to the Hutchinson statement.I am quite aware that some law enforcement officers sometimes stray from official procedures and directives.What I don't know is that there were or are formats condoning and authorising such activity. Especially in documents that might have to be tendered at trial. I alluded to 'my' theory, the fact that you raised the question in contention with 'my' theory. Any difficulty I have is your latest claim of Lewis being in Keelers rooms at 2.30,and that all statements of her reaching and entering the court at that time are wrong. I always try explain it as detailed as I can. If you have any problem with her claiming to have passed the Britannia "about 2:30", then being at the Keylers "at 2:30" - all taken from her inquest testimony, then perhaps you can explain alternate meanings for "about" & 'at". They seem pretty conclusive to me. One little difficulty I do have though,is Lewis following and observing Kelly and Aman in the court as she(Lewis) entered.You have claimed that. No Harry, I have not claimed that (or, can you show me?). In her own words Lewis says "there was no-one in the court", when she got there. Lewis did not see anyone in the court. At that time, if you read Hutchinson's statement carefully,He (Hutchinson) would have still been at, or just leaving the corner of Commercial/Dorset street,so could not have been the person Lewis observed standing outside Crossinghams.So who was the person at Crossinghams? At what time? (you did not give one). Lewis claimed to be at the Keylers at 2:30, so her seeing a man outside Crossinghams has already happened, just minutes before. Hutchinson did not leave until about 3:00. When have you known me to be shy? All the posters who assert Hutchinson lied (without identifying the lie), especially those who claim it was proven he lied, can be found here. Yes I know the name Brideswell.Perhaps you will post a reference to show that what he says directly refers to the Hutchinson statement. I was under the impression the statement was in Hutchinson's own words, everything. It was Bridewell who explained that is not always the case. He has made this point more than once (not surprising). Here is one example, in reply to Ben. "What happens during the taking of a witness statement is that the officers elicits the information from the witness in a Q & A process, so as to get it clear in his (or her) own mind what the witness is trying to say. He (or she) then records that information in a structured, chronological (and hopefully coherent) form." I am quite aware that some law enforcement officers sometimes stray from official procedures and directives.What I don't know is that there were or are formats condoning and authorising such activity. Especially in documents that might have to be tendered at trial. Perhaps you can help clarify what the "official procedure" was? I would have thought the official procedure was to take down what the witness said verbatim. Anything else leaves the police officer open to accusations of tampering with witness statements.